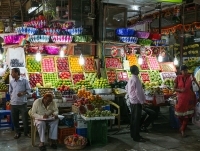 The colourful indoor Crawford Market (Mahatma Jyotiba Phule Market) is where locals of central Mumbai go shopping for their fruit, vegetables and (for the brave) meat. Rudyard Kipling was born just south of the market, in 1865. An ornate fountain designed by his father, Lockwood Kipling, sits between old fruit boxes at the market's centre. He also designed the frieze depicting Indian peasants in wheat fields which hangs above the main entrance. You can find almost anything at the market which is large and full of surprises. The animal market at the rear sells everything from poodles to parrots in small cages. Visitors will enjoy a stroll around the narrow lanes of Kalbadevi, north of the market. This predominantly Muslim area is a seething mass of people and traffic and is the location of several markets selling jewellery, textiles and leather goods. The most famous is the Chor Bazaar, Mumbai's 'thieves' market', which sells 'antiques' and miscellaneous junk - don't place too much faith in the authenticity of anything sold here. This area is also home to the Jama Masjid and the Mumbadevi Temple, which is dedicated to the patron goddess of the island's original Koli inhabitants.